There’s A Top Cosmetic Dentist in OKC Not Far From You! Tall, short, wide, and thin, most people have wanted to improve or change some aspect of their appearance since, oh, forever. These days, that means having a perfect smile — and it’s achievable when you visit a cosmetic dentist you can trust. But with so many general dentists adding aesthetic services to their list of treatments, how can you know which one is right for you? It’s not easy to choose the right cosmetic dentist in OKC, unless you know Dr. Joe Isaacson was recently named one of the 20 Best Oklahoma City Dentists from Expertise! That’s out of 150 dentists, by the way — and it’s really exciting to be selected by this respected group. For his superior service and patient satisfaction, Dr. Isaacson was also named a top 10 dentist in 2016. Oh, and we can’t forget about his 5 star rating on Dr. Oogle, a site that lets current and former patients share their experience and satisfaction on any doctor. All that adds up to a dentist you can trust for all of your smile needs — including, of course, cosmetic dentistry. Dr. Isaacson is pleased to offer a number of cosmetic services and builds personalized treatment plants suited for each patient’s unique needs. Lumineers are a type of porcelain veneer that provides a makeover for damaged or imperfect front teeth. They are thin coverings of natural-looking porcelain that are bonded onto the front side of the teeth that show when you smile. Lumineers are so thin that they can often be placed directly onto the tooth without any alteration of the natural tooth structure. Most adults will experience tooth staining or discoloration as they get older, as frequent exposure to highly pigmented foods and beverages, lax oral hygiene, and other factors take a toll on the color of the teeth. Zoom! Whitening offered by Dr. Isaacson can break through external and internal stains to reveal teeth up to 8 shades brighter in just one visit to the dentist. Clear braces allow adults to enjoy straighter teeth and more confident smiles without having to wear visible metal braces for two or more years. Invisalign uses clear plastic aligners to gradually shift teeth into the proper position. It’s a convenient, discreet, and comfortable alternative to conventional braces. 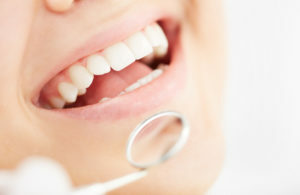 Yes, Cosmetic Dentistry Is Right for You! Almost all adult patients are eligible for at least some aspect of cosmetic dentistry. You should be in solid oral and overall health to help ensure all procedures are completely safe, so your dentist may suggest a checkup and cleaning before beginning with cosmetic dentistry. Once that is complete, you will be eligible for the range of options offered by Dr. Isaacson — and that means your best smile is within reach! If you are interested in how your smile can be transformed through cosmetic dentistry in Oklahoma City, please do not hesitate to contact leading dentist Dr. Isaacson. He can’t wait to help you reveal your most stunning smile — you are invited to schedule an appointment online today!